All of Cannondale’s North American OverMountain team members will race this year on the new SuperMax Lefty fork, including longtime Fox Racing Shox rider Mark Weir—who is rapidly recovering from serious injuries he recently sustained in a freak accident and is planning to race this season. The new fork, a redesigned 160-millimeter-travel Lefty, has been put through the ringer over the past several months by all members of Cannondale’s OverMountain team, including Weir and enduro standout Jerome Clementz. While Clementz is still under contract with SRAM and will be racing on a RockShox fork this season, he still has been involved with the testing and development of the new SuperMax Lefty. The other OverMountain team members—Ben Cruz, Jason Moeschler and new addition Marco Osborne—will all race this season on the SuperMax Lefty. All of the team riders were instrumental in the development of the SuperMax’s new internal components—particularly the new “Wide-Mouth Piston,” which is designed to increase small-bump sensitivity and the high-speed suppleness of the fork. Cannondale says the SuperMax’s dual-crown structure radically increases its stiffness, while the single-leg design keeps it as light as some cross-country forks on the market. Cruz has been particularly involved in the new fork’s development and has been testing it for the better part of a year. Meanwhile, new team member Marco Osborne—who, like Cruz, is another protege of Weir, who has taken him under his wing—is said to show great promise. Weir, who has been sponsored by Fox Racing Shox for over a decade, will continue his relationship with the company and will race on their rear shock and dropper post. Weir says his decision to race on the new long-travel Lefty was the result of Cannondale’s proven dedication to him and his teammates. 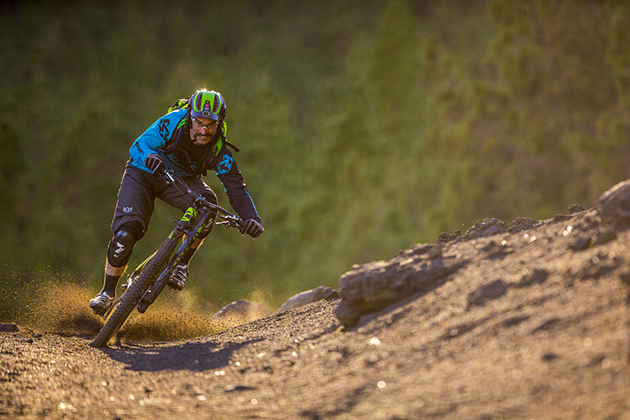 You can check out Cannondale’s OverMountain line of bikes at cannondale.com. Mark Weir might have broken his sacrum, shattered his pelvis and fractured the base of his spine, but never mind that, he’ll be back racing enduro this summer. And for the first time ever, he’ll be racing on a Lefty.